KweenBee and Me: OMG...It's Finally Done! That's right, I finally sewed the last end into my afghan as of yesterday! After months of hard work, I started this project in May, I can finally say it is completed, listed and safely tucked away in my finished projects bin awaiting to be sold to some lucky person. This project was a major undertaking and at the time when I started, I thought it would be an enjoyable process. It was until I thought I was finished and realized just before I was to start the edging, that it was WAY too short and needed to have another row of stars and houses to make it look, well, normal. So it was back to the sittin' spot to make three more panels. Needless to say, I don't think I see myself creating another one any time in the near future. I like the idea of pillows with a cross stitched design on them, but another afghan, no. Now for some shameless promotion...Do you love it? Want to buy it? Add it to a Treasury? Make it a favourite? 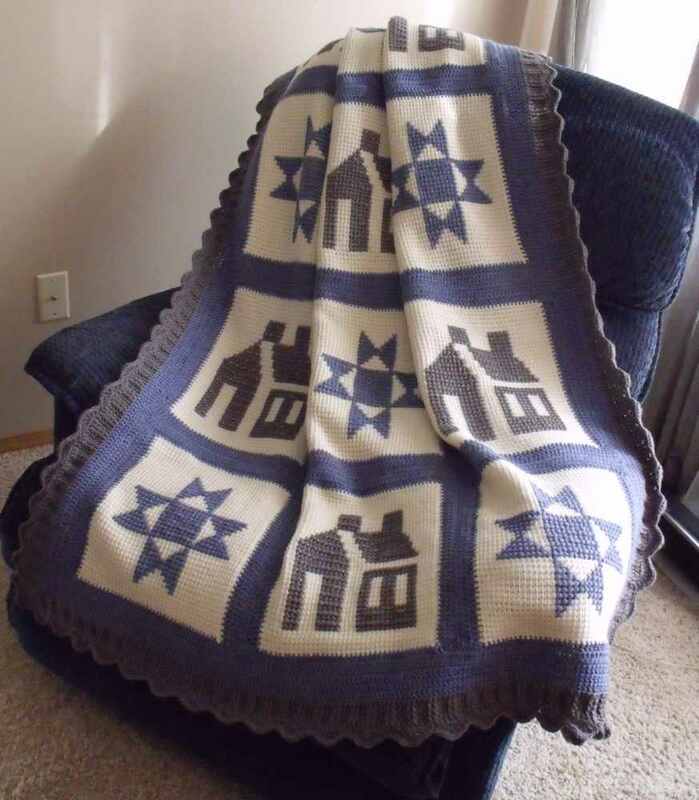 You can do all of this if you see my folk art inspired blanket in my Etsy shop. Think you would like to make your own? I've already shown how on this blog. Just click the Crocheted Afghan link under Patterns on the left. 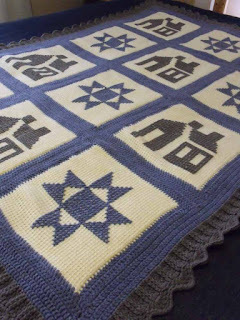 You can also see a little of how this afghan looked during it's creation. Hummmmm. What next? I guess we'll both have to wait and see. Wow! That is some incredible work...I'm sure it took lots of patience, but it was well worth it! Congrats on finishing! Holy cow. That's a LOT of work. You deserve a round of applause!